April showers bring May flowers….or flooded crawl spaces and basements! Seasonal water damage isn’t as obvious as you may think. It doesn’t take a severe flood to do water damage to your home just increased saturation. For most of the Wenatchee, Leavenworth and Seattle areas we’ve experienced an increase in precipitation and strong winds over the last week. Now is the time to pay close attention to your crawl space, basements and drainage in your yard. Right now is a good time to take a trip down to your crawl space. Prolonged moisture in the crawl space can attribute to mold, mildew, sill rot, joist rot, soil settlement, contamination of insulation and insect attraction. Monitor the walls in your basement for signs of moisture as well. Follow these tips to keep the water out of your home. Clear gutters and downspouts of debris ensuring that water will be pulled from the roof and away from your home. Remember, a downspout doesn’t do any good if it deposits the water next to house! If your home’s yard frequently floods like the picture then you have problems resulting from a negative grade to the property. In other words your home should built up so that water slopes away from the home’s foundation. Finally, clear the storm water drains on the streets by your home frequently. This will avoid blockage and buildup of water causing dangerous street and property flooding. Should the property become a bigger problem than you can manage call the municipality. Of course, we are happy to perform a maintenance inspection on your home to determine any damages resulting from seasonal floods or moisture intrusion. Follow these steps to get your home ready for the cold weather. For more detailed information about insulating your attic or dealing with air leaks around the home feel free to contact me at info at amsinspection dot com. Clear debris from your home’s gutters before the winter sets in. Clogged drains can bend gutters, promote ice dams and cause water buildup- all resulting in possible moisture infiltration through your roof and/or walls. Make sure the downspouts are carrying water away from the home’s foundation. Clogged downspouts won’t help you either. After a big wind storm sometimes downspouts will fall off the drain pipes, so make sure they are firmly attached. 2. Winterize underground irrigation systems. You may want to call a professional service to winterize your underground irrigation system. Turn your system off, then bleed the line (release pressure) and drain the water. Confirm that the settings are adjusted or that the system is completely turned off before the first freeze. 3. Clean the furnace and baseboards vents. Due to seasonal dust buildup, you’ll probably notice a weird smell when you turn them on for the first time. Using “duster” computer keyboard cleaner works great for cleaning the vents on your furnace and baseboards but you can also use a dust broom or vacuum attachment. Throughout the winter you should change the furnace filters regularly. A dirty filter reduces air flow and efficiency and is a potential fire hazard. Inspect your chimney for creosote (baked soot) buildup which is highly flammable. Inspect the chimney for any obstructions: limbs, leaves, baseballs, etc. Wood stoves should be swept routinely throughout the winter. Make sure the spark arrester is properly screened to avoid debris buildup. Dealing with a busted pipe is never a good thing especially in the winter. Wrap exposed pipes in crawl spaces, basements or garages with pre-molded foam rubber sleeves or fiberglass insulation. Heating tape is an added measure that is commonly used in our area. Turn off the water to your hose bibs. You should find a valve turnoff inside your home. Drain the lines and hoses. Then store the hoses away from the elements. Fire departments have tried to educate us that when you change your clocks for Daylight Savings, it’s also a prefect time to change your smoke detector batteries. Detectors should be replaced every 10 years. Additionally, testing them with a small bit of smoke is always a good idea. Check your carbon monoxide detector or buy one if you don’t already have one. Refer to the installation manual regarding correct placement for the detector. Water is a remarkable liquid. You know that saying, “give them an inch and they’ll take a mile.” This could be said for water. Without adequate grading (slope adjusting) and drainage a few rain drops may compound into a huge puddle of problems. The main objective with moisture concerns is to pull the water away from the home. This is remedied by roof, gutters, downspouts, grading and drainage. It seems fairly straightforward, but it’s always good to check these components regularly. Seasonal patterns can affect the integrity of your system. Ice build-up in the winter can bend gutters. Leaves will clog downspouts in the fall. 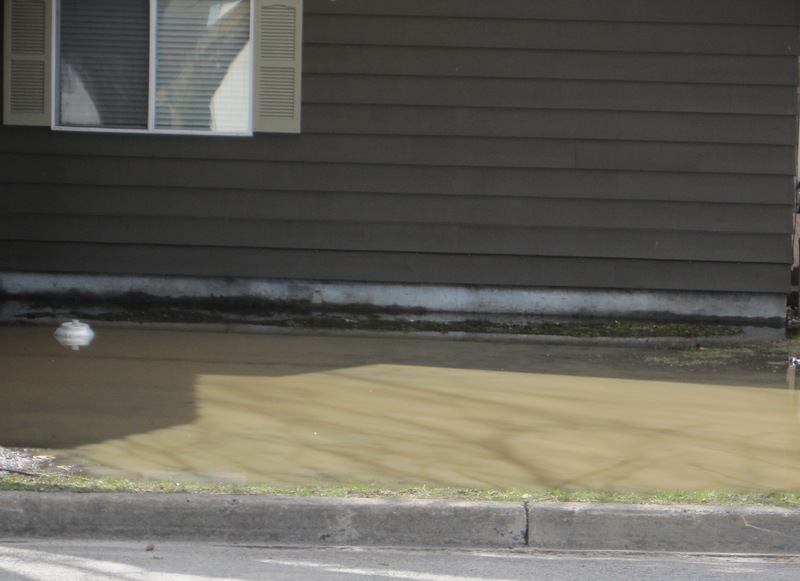 Excessive rains in the spring way erode slopes or wash in debris to your drainage lines. Check your basement and crawl spaces routinely for signs of moisture. You may need to amend the grading to channel surface water away from the home if your puddles start turning into small ponds.